Can JPMorgan’s Securities Trading Revenues Cross $20 Billion For 2018? Why Has Citigroup Trailed Its Peers In Terms Of Investment Banking Fees For The Last Year? How Much In M&A Advisory Fees Did The 5 Largest U.S. Investment Banks Generate In 2016? The 5 largest U.S investment banks reported $9.5 billion in M&A advisory fees in 2016 – just under 32% of the total figure for the industry. Total M&A advisory fees for the industry are taken from Thomson Reuters’ latest investment banking league tables. 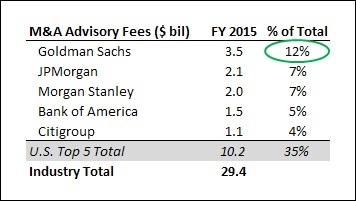 The chart below captures the total M&A advisory fees reported by the five largest U.S. investment banks since 2012. The green-to-red shading for figures along a row show the variations in these revenues for a particular bank over this period. The global M&A advisory business has seen a sizable improvement in revenues over the last five years, and the U.S. banks have made the most of their strong global presence to increase their wallet share from 27% in 2012 to 35% in 2015. Fee revenues for these banks fell slightly in 2016 as total M&A deal volumes normalized from the unusually high figure seen in 2015. Goldman remained the leader in the global M&A industry with the premier investment bank capturing roughly 10% of all advisory fees. Notably, Goldman has held on to the top spot in terms of total annual M&A fees each year since at least 2005. How Much of The Global M&A Industry Did The Largest U.S. Investment Banks Capture In Q4? How Have Total M&A Deals Closed By Major U.S. Investment Banks Trended In The Last 5 Quarters? How Much In Equity Underwriting Fees Did The 5 Largest U.S. Investment Banks Generate In 2016? How Much In Debt Origination Fees Did The 5 Largest U.S. Investment Banks Generate In 2016? How Has Home Depot’s Revenue Performed And What Is Its Outlook For 2021? What To Expect From Credit Suisse In Q1? Will New Domain Name Registrations Drive Verisign’s Growth in Q1? What To Expect From Intuitive Surgical’s Q1? How Did HSBC Fare In Fiscal 2018? Sign up for the complete Trefis experience. Thanks for signing up! Please check your inbox for an important e-mail from us. ©Copyright 2017 Insight Guru Inc. All Rights Reserved. How likely is it that you would recommend Trefis to a friend or colleague?